I was obviously very hungry last night with nothing in the house to eat. I made a onesie with a felt hamburger on it and a bib with a felt hamburger on it. The other is a white bib with some green sparkle thingies and the feed me bib which i love. 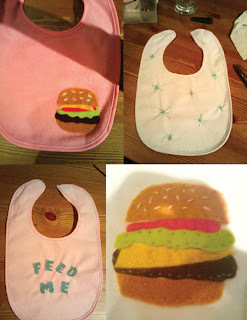 I glued the felt hamburger on the bib with a glue gun which i dont know was a good idea or not. The sesame seeds surely wont last one wash. I think i need to wash it and test out. The cheeseburger onesie in real life is SO CUTE. I really like the twinkle bib! I would totally wear that to eat lobster. nina you are brilliant im making a lobster baby bib! I know you were trying to ask me this the other day about the hot glue, but I wasn't online. Hot glue, it's not that great in the dryer. I don't recommend it. But there is this fabric bonder stuff that is called Heat and Bond that comes in a roll and you cut it and iron and it fuses the fabric together. Much,much better.